Style and intelligently scaled difficulty make Dustforce an instant classic, and a lesson in the rewards of hard work. Playing Dustforce whisks me away to some of my fondest and most formative gaming memories, when every ounce of my being was devoted to full completion of Donkey Kong Country 2 on my dingy Super Nintendo. Today, I'm grown up and paying off bills, but the elements that make a great platformer are pretty much the same. Sublime music, well thought-out controls, gorgeous graphics, and accessibility that scales into supreme difficulty—Dustforce possesses all these traits in glorious abundance. As a member of the titular team of spry sweepers (which includes a vacuum-wielding geezer and a triple-jumping lass with feather-duster pom-poms), you're charged with banishing colorful dust and debris in over 50 levels. Dirty floors will be spotless once you've swept past them, but elsewhere, grime will require a more aggressive approach with a quick smack from your broom. The scattered soot pays off in two ways: cleaning every smidgen of dust in a full combo awards you with a flawless S ranking for the level's Completion and Finesse ratings. But while you're still learning the optimal path for traversing the elaborate stages, the dust-, leaf-, trash-, and ooze-covered surfaces act as a guide for how to tackle each jump and wall-run. At first glance, most players will immediately associate the nimble maneuvering of Dustforce with the brutal-yet-lovable Super Meat Boy—but they're actually opposite sides of the same “blissful platforming” coin. 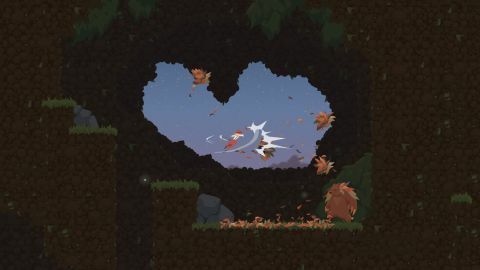 Instead of SMB's anxious intensity, frantic music, and merciless difficulty, Dustforce takes a more calm, almost meditative approach (backed up by soothing, ethereal background music that mitigates frustrating death streaks). Fluid animations and beautifully stylized character designs also contribute to the zen of janitorial service. You've also got more movement options at your disposal than typical running and jumping—mid-air dashing and downhill acceleration are crucial to clocking the fastest times. Coming to grips with the controls is initially daunting—but master them, and you'll feel at one with your custodian of choice. Each level has plenty of checkpoints, and at first, you don't need perfect execution to advance, which goes a long way toward cushioning the effort some levels take to master. But to unlock later stages in the entirely non-linear hub world, you'll need to ace some runs for keys. Faultless play can be a bear to pull off, but by the time you reach the most demanding stages, Dustforce will have given you plenty of training. And the hub world is a stage all unto itself, letting you freely explore and discover craftily-hidden doorways—provided you're adept enough to reach them. Pro gamers can mop the floor with the competition via the online leaderboards, with replays for every entry to see who's got the swiftest Swiffer. There's also plenty of fun to be had in the local multiplayer (provided you've got three buddies nearby)—you get the chance to spread the filth instead of sweep it in chaotic, Smash Bros-esque romps. Once you've traversed enough levels and embedded yourself in the rich atmosphere of Dustforce, you'll appreciate how it distinguishes itself from equally brilliant platformers like Braid and Limbo: rather than putting a new spin on sidescrolling, it spit-shines the core mechanics to near-perfection. The payoff: an exhilarating sense of kinetic agility.